The Primary program is a multi-age three-year cycle that includes children aged three through six. Children experience an academically enriched environment within a well-ordered social community. A special characteristic of the Montessori Primary program is that the classroom encompasses the areas of learning and socializing that are designed to foster independence, concentration, self-motivation and a love of learning. Another feature of the Primary classroom is that the materials are accessible to the children. They are free to choose activities appropriate to their level and progress and develop at their own pace. The materials and lessons are categorized under the following areas, which are all interrelated to help children achieve maximum success. Practical Life Exercises have as their goal the adaptation of the child to his environment and growth of his independence, focus, concentration and self-control. This goal is accomplished through the development of coordination and controlled movement, by which the child will be enabled to care for both him and his surroundings, thus establishing him in his society through courteous relations with others. For this purpose the child is provided with special materials scaled to his size and with which he can enjoy such tasks as sweeping, dusting, polishing, washing, tying and buttoning. These exercises provide the child with a clear relationship between the “prepared environment” and what he has seen his own family do, thereby allowing him to contribute to the life he sees around him. A child is brought by nature to the task of classifying those materials that surround him. The Sensorial Materials of the Montessori Classroom are designed to aid the process of classification of the environment which has already begun, this enabling the child to arrive at a conscious level of discrimination rather than a vague one. 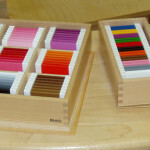 These materials are designed to develop the senses of hearing, vision, touch, taste, smell and perception, as well as the ability to discriminate between shapes and sizes. These lessons prepare the children for later work in Mathematics, Botany, Music and Art. Language is the essence of the development of the children because it enables they to communicate with others and understand when they communicate. Within the Montessori Classroom you child’s vocabulary is enriched by storytelling, conversation and poetry. The Montessori child begins reading when he is ready and proceeds at his own pace. 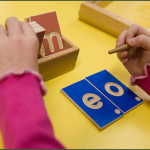 Sandpaper letters provide a phonetic basis for reading. The child hears the sound, sees the shape, and prepares his muscles for writing by the light tracing of the letter with the fingertips. Many other exercises for both reading and writing are found in the environment. Geography, Biology, Botany, Zoology, Art, Music and Drama are presented as extensions of the sensorial and language activities. The mathematical mind is an ability inherent to all human. Therefore is essential to make a child’s natural mathematical tendencies by coupling these with his innate urge for exploration, repetition and exactness. The materials for mathematics introduce the concept of concrete quantity before the abstract. 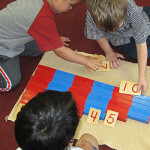 The quantity is introduced by a series of rods that the child can count and compare. Beads and symbol cards familiarize the child with the decimal system. These exercises provide a conceptual understanding of the function of numbers for later work in algebra and geometry. Biology, botany and zoology puzzles, card games and booklets broaden children’s awareness. The children will also carry out various science experiments in the classroom. Working with these cards or puzzles helps the child become more observant of the characteristics of things which grow in their own environment. Besides offering a vehicle for creative expression, the art program provides enrichment to an already stimulating curriculum. By examining the works of may fine artists as well as the arts of many cultures, the child can become witness to the unique way that people have recorded their vision of the world and wonders of nature. 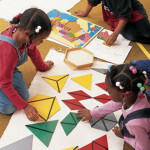 Geography maps puzzle help children to visualize their world. Through these maps children learn the names of many of the countries, as well as, information about the counties. The maps illustrate many geographical facts concretely. Cultural diversity is introduced through the use of Puzzle Maps, celebrations, etc. Explorations of people and cultures in other countries with an attitude of respect and admiration, children are encouraged to become aware of their own culture and accepting of others. Our Montessori Primary Program is designed to foster independence, concentration, self-motivation and a love of learning. Another feature of the Primary Classroom is that the materials are easily accessible to children. They are free to choose activities appropriate to their skill level, allowing children progress and develop at their own pace. 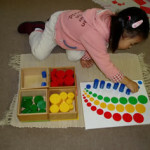 In Montessori we enjoy watching the child’s choices and progression in different areas. For example: A Child as young as 4 years old, who has mastered all the letter sounds, may begin to sound out and spell words. Children often learn to spell phonetically before they learn to read. If ready, children may begin to build words with the movable alphabet (letters), with pictures or objects with 3 letter phonetic words. They can develop into building sentences and even composing their own stories with the wooden letters. Often they will be able to write these stories on story paper with illustrations. For more information about Manalapan Montessori and our primary classes, fill out our online form or call 1-732-536-8181.